Opportunity often comes disguised as an ordeal. That’s exactly how a solo trip to Kutch fell into my lap, as an ‘individual’ college assignment. There was more. It came with a deadline, and I had to be back in college in 5 days! I had no clue how or where to begin, for student-days meant living on a budget. But thanks to the accompanying gut instinct, ‘this is going to be more than just a college assignment’, I decided it’s happening. Frantic calls were made, hasty notes and contacts were exchanged and before I knew it, I was on a train from Delhi to Ahmedabad, on an almost unplanned trip to a strange, rustic land. Despite the initial hassles, I can’t begin to explain how much fun this trip was, connecting with people from a new culture, new land and with no common language between us, getting to see artisans, their intricate, precise, labor intensive crafts and their unmatched hospitality, the region’s amazing textile heritage, the delicious food, and the best part – the most amazing driver, who understood what I was looking for and made me such a perfect itinerary, I couldn’t have asked for better! My first visit was to Khamir, where I got to know there was a an exhibition of the region’s oldest traditional dresses that was drawing in textile connoisseurs from around the world. It’s not often that one gets to see a private collection with such well-written explanations and stories in India, I was lucky to be there. It is always nice to be able to see crafts and textiles as an educational experience, even if you can’t buy them. One particular piece, dyed using the Bandhani technique, had 90,000 knots and had taken a woman twelve months to tie. It was a lesson in patience and precision! A cluster of village women had also put up some very interesting work using recycled plastic. After collecting plastic from garbage dumps and cleaning them, it was woven into funky table mats, bags, and floor mats. The artisans were quite a sport and let me try my hand at a piece in progress! Next was Hodka village, where I met leather artisans, who used simple tools to punch holes into leather to create the most elaborate designs. On my way back from Hodka, I made a stop by the Kala Raksha museum. Not much of an embroidery fan or even other forms of ornate embellishments, I did spend a couple of hours looking at these museum pieces. I learned that women would spend up to ten years working on a single piece for their dowry. It gave me a whole new perspective of looking at these creations, these women’s youth was embroidered and woven into those beautiful textiles. Perhaps the best part of the trip was the time I spent at Ajrakhpur, with Sufiyan Khatri and his family. Using those beautiful wooden blocks, he let me create my own little piece of hand block printed textile that I carried back home with me. I later got it stitched into a shirt! 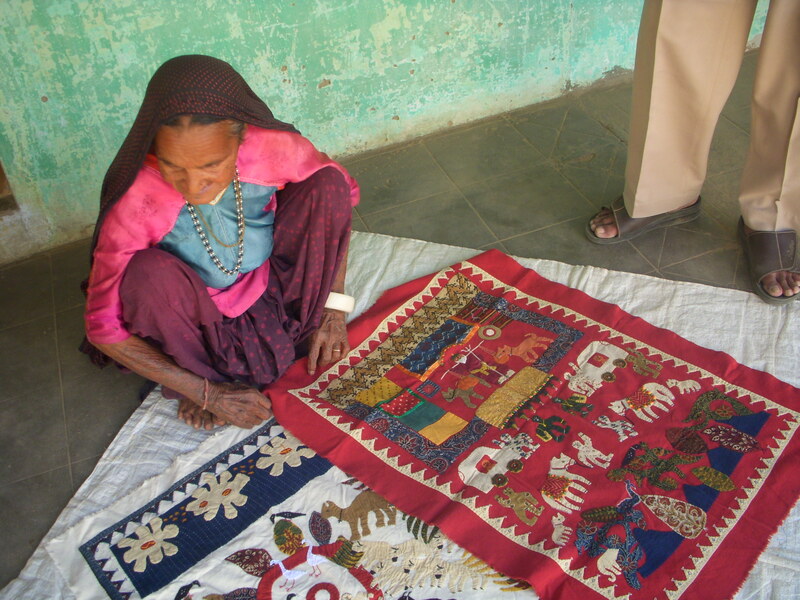 What was most amazing about this trip was the sight of women embroidering, the most common across Kutchi villages. It could be anytime of the day, and you’ll see women and girls at work, with thread and needle, and small bits of colorful fabric. Heads bent, hands constantly going up and down, as a shy smile plays on their lips. Each community has a different kind of embroidery. 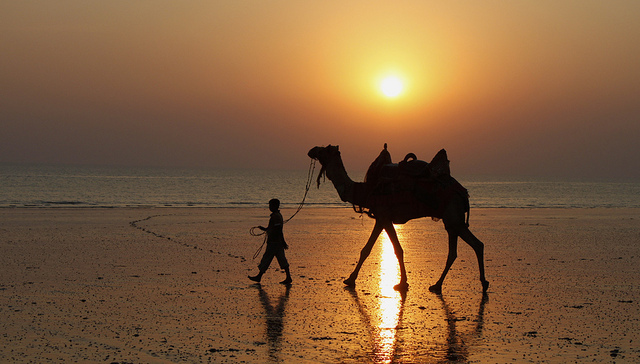 The last leg of my journey was a walk on the beach in Mandvi, watching the birds, camels and windmills rotating over the cool water. I took a short camel ride towards the romantic Vijay Vilas Palace, the beautiful weather made it even more special. 1. Sometimes, there is some power somewhere, that is designing a customized escapade just for you. All you have to do is have faith, and not intervene….. lest you spoil it! 2. You might think so, but you’re never traveling solo. Posted in Crafts, Embroidery, kutch and tagged diaries, diary, Indian Village, kala raksha, khamir, Kutch, solo, textile, Travel. Bookmark the permalink.